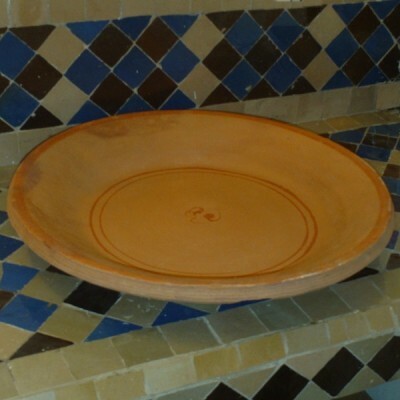 Moroccan Terracotta Tray used to prepare couscous in Morocco. Traditional Pottery of Morocco hand made in Marrakesh. To make a couscous, Moroccan Women use hands to separate the grains in this terracotta tray. This may take more than one hour before adding the Moroccan flavoured aged butter. In Morocco, Couscous is shared with some friends in a Moroccan living room, every Friday of the week.